Highlands and Islands Airports Ltd operates 10 airports in the North and West of Scotland. In addition to scheduled flights the airports handle around 5,000 air ambulance and search and rescue flights a year.Air transport is vital to remote communities making it imperative that in the event of serious power failure the airports are able to continue to operate.HIA Ltd has used Metalite’s first portable runway light, the LE58, at each of its airports for many years and in 1996 the company purchased their first CALKIT™, Metalite’s trailer mounted portable runway lighting system. 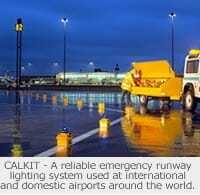 In 2003, as part of an ongoing commitment to meeting regulatory and safety requirements, a further three CALKIT™ trailers were acquired for use at Tiree, Stornaway and Islay airports.The CALKIT™ forms part of the company’s contingency plans to ensure that Highlands and Islands Airports can continue to function should a major power outage occur.